Chongqing graduated from Lanzhou University of China (中国兰州大学) with Diploma in Chinese language literature (中国文学系汉语言文学专科). Upon graduation, she worked as a news writer for a local broadcasting company. Chongqing became a skillful Chinese writer through career training on business best practices. In her profession ChongQing was often assigned to coach interns and new staff on the job. She always enjoyed these assignments as they gave her great opportunities to meet and share experiences with students from diverse background. She took pleasure in researching and pursuing new ideas together with them. It was rewarding to see students and young staff making professional production under her care. As career coach ChongQing always inspired students and young staff to strive for excellence. She also worked as a volunteer tutor during her free time to help students on Chinese Literature and Classics. She taught students the proper usage of Chinese language and the skills of writing. Students are assured of the best guidance in Chinese language as she helped them to build confidence for greater achievements. ChongQing is able to kindle interest among her students in Chinese language. She believes that interest is the best teacher. She accepts students as they are and helps them to explore on their strengths for better learning. Her approach is to stimulate students’ interest in language learning. Students naturally achieved academic excellence when they are inspired to discover more about the Chinese language. ChongQing was also freelance columnist with Chinese newspapers and magazines, contributing poems, essays and stories. She sprinkles her writings with concise and lively phrases to present fine and delicate details. Her outstanding style of writing won her many journalism awards, of which the highest was a Provincial silver award for TV news reporting (甘肃省电视新闻二等奖). Her longest story was more than 100 thousand words. ChongQing moved to Singapore and became permanent resident in 2003. 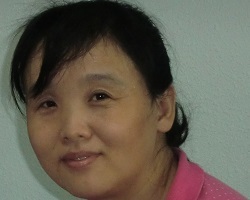 She started with giving free Chinese and Higher Chinese tutoring to some primary and secondary students in her church. Through helping these students, she adapts and localizes her tutoring skills for Singapore Chinese learners. She finds herself in a new learning journey as she explores creative approaches to inspire Singapore students to learn Chinese. She became professional Chinese tutor in 2011. She teaches students up to Junior College and International Baccalaureate level (IB Chinese A and B). As a mother of two, she is also comfortable with tutoring primary students.